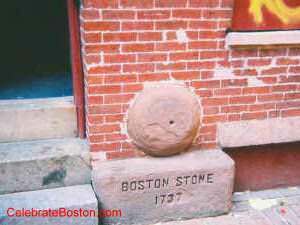 Along the Freedom Trail, just past Faneuil Hall and the Union Oyster House, is the Boston Stone. The stone is embedded in the side of a building on Marshall Street. Marshall Street is a narrow alley, and the stone is on the right side of the lane if walking toward the North End. The mill-stone was originally used for grinding substances that became pigments in paint. The stone was imported from England in 1700 by the painter Tom Childs. The previous paint mill building at this location was torn down or destroyed, and the mill-stone was then found and embedded in the current structure. The stone is hollow, and about two feet in diameter. The inscription at the base reads "Boston Stone, 1737." For many years the stone was used as a starting point for surveyors, making it famous. It is suggested the name was taken from the ancient "London Stone," used by the Romans as a central point for many roads. The Liberty Stump, was another famous reference point used for measuring distances. The Ebenezer Hancock House is opposite the Boston Stone on Marshall Street. This area is known as the Blackstone Block, and its east face used to parallel the old Mill Creek. Mill Creek was a canal that dissected the North End district from Boston proper. The creek flowed with the tide from the harbor to Mill Cove—a salt pond at the end of the Charles River—which is the North Station area today. In the 1600s, toll bridges used to span the creek. Marshall "Lane" is one of the few remaining streets in the city representative of 17th century Boston. Mill Pond, Mill Creek, and areas near Christopher Columbus Park, were all filled-in during the mid-1800s.